The fourth iterations of the Atlantic Resolve armored and aviation rotations will begin arriving in Europe over the next two weeks. 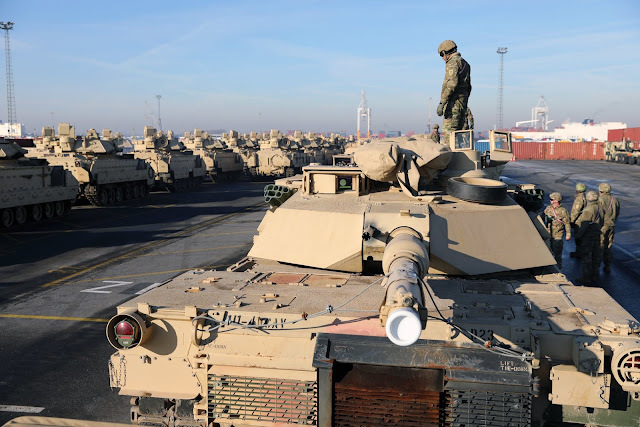 The equipment for the next armored rotation – 1st Armored Brigade, 1st Infantry Division, from Fort Riley, Kansas - will come into Europe at the port of Antwerp, Belgium. From there, approximately 400-wheeled vehicles that will convoy through Germany to Poland. For four days there will be five separate military convoys containing about 20 vehicles each. All tracked vehicles will move by rail. All outgoing equipment will be transported by rail. These movements will occur at night to lessen the impact on public traffic; however, there may be temporary disruptions to road and rail traffic in North Rhine-Westphalia, Lower Saxony, Saxony-Anhalt, Brandenburg and Saxony. All movements are approved, coordinated and supported by the Bundeswehr Kommando Streitkräftebasis [Joint Support and Enabling Service Command] and ensures that all local authorities and the Bundeswehr Landeskommandos are notified. The equipment for the next aviation rotation – 1st Combat Aviation Brigade, 1st Infantry Division, from Fort Riley, Kansas – will come into Europe at the port of Zeebrugge, Belgium. From there, the aircraft and equipment will move by rail, barge, commercial line-haul, military convoy and air to designated locations in Germany, Latvia, Poland and Romania. All outgoing equipment will be transported by rail. Aircraft from Germany and Poland will fly to the port of Bremerhaven, Germany. The deployment of ready, combat-credible U.S. forces to Europe in support of Atlantic Resolve is evidence of the strong and unremitting U.S. commitment to NATO and Europe. Through continuous, multinational training and security cooperation activities, Atlantic Resolve builds readiness, increases interoperability and enhances the bond between ally and partner militaries.